I rarely go above 42nd Street unless the joint is called Lenox Lounge or my local pub Conker Hill. Mine isn't your typical downtown snobbery,it's worse - Brooklynese. See I'm from there, live there, and play there so these days I don't have to go to the "city" unless work is involved. For more on that meet me next month at the Clover Club. But a serene siren's call lured me north, into the Times Square area, through the crowd of rabble, gawking tourists, and skells. The lovely Amie Margolis and her Amis were celebrating their CD release of "Strictly Sirene" and Amie's birthday at the Producer's Club. The Iluras Lounge in the Producer's Club is a tight room and intimate setting - 10 x 11 caberet stage and full bar. The place was friggin packed too. So I grabbed a Tanqueray and tonic and held up the wall in the back of the room to get the whole picture. Tin ceilings painted red, hardwood floors, plush couches, the dark walls, red curtains, and low lighting gave the sense of back room in a private club or boudoir. I made my way to the bar as the band got started. 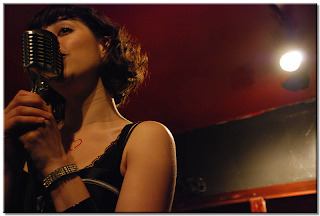 Amie Amis are an eclectic band that perfoms a variety of jazz infused music with French pop undertones. Their range of influences include Stereolab, Tom Waits, Edith Piaf, Cibo Matto, Django Reinhardt and a list of jazz artists too long to list in this blog. Amie Margolis front the band and alternates between vocals and the French Horn. Her Amis include Ben Cassorla (guitar), Ryan Cavan (drums), Brad Maestas (bass), Mike Irwin (trumpet), with Nick Kadajski and Kevin Russell on the saxophones. They performed some of my favorite songs on their old album, Parfum No. 5, include Pour Degas (vocals in French) with a great horn selection, Cockatoo Vow - a poppy melodic crowd favorite, and also debuted their newest number from the self-named album Strictly Serene which showcases Amie's vocal range. The show was outstanding and well worth the trip. I enjoyed the energy and diversity of the band's music. I had a good time all around, ran into some old Loungers (ciao Chiv and Zahra), cut a rug, and met new friends too. I even scored some delicious cake. Merci beaucoup Amie Amis! Check out their next gig at Spike Hill in the glorious borough of Brooklyn on May 15th!